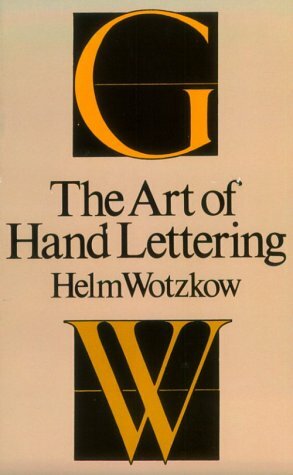 Helm Wotzkow wrote "The Art of Hand Lettering - Its Mastery and Practice" in 1952. I know we live in a time of 3-second attention spans now, but to me, Wotzkow's introduction and descriptions of his tools, his methods, and his experiences are a joy to read in their earnestness. I really appreciate the attention to detail, back-to-basics, and descriptive explanations. Size - How much space do your letters have, and how will they be displayed? Designing a logotype and a monogram are two different things, especially if one has to fit onto a small surface like a fav icon in your URL bar. Form - What are the aesthetics of the piece, and what do the actual letterforms look like? Some styles simply lend themselves to better communicate a certain message, e.g. designing a warning sign in an all caps script style will take readers too long to read; the letters should be congruent and appropriate to the message. Weight - How thick are the strokes, i.e. how much black ink is laid down on white paper? The weight of letter strokes informs the proportions and contrast of the piece, which in turn influence letter form and legibility. Check for even weights by holding your paper at arms length and upside down to see if there are blobs of color evenly distributed, or if some areas stand out. Layout - How can you arrange the words on the page to greatest effect? Taking care of size, form, and weight of your letters puts you well on your way to a good lettering piece. Now the composition of your phrase takes it one step further, and requires strategic thought. You have to decide which words to highlight, where to maybe change styles, where to add illustration or filler material... the options are endless. Spacing - Are the positive and negative spaces visually pleasing? Each time you draw a line, you define a white space around it. Look for the spacing between letters, between words, between lines, and the space within your individual letters (e.g. the bowls of your b's and d's, your o's and a's - are they similar?). The size and spacing will inform your margins and influence legibility. Execution - How polished does your piece need to be? Wotzkow talks about execution in terms of the finishing touches and "polish" that you give to your work. He distinguishes between e.g. large block letters on a showcard and intricate details on elegant personal stationery. Again, it helps to keep in mind the goal of the piece, where it will be displayed, and how it will be used. If you have any other book recommendations from that era, please share them!